Capacity : 0-5Kgf. to 0-20Kgf. Description : 20210-AL is S Shaped Bending Beam strain gage based Load Cell which is temperature compensated over 0 - 60 deg.C. It is constructed from Aluminium alloy for portability due to light weight. 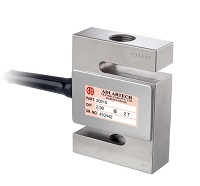 It is universal type load cell for tension and comperssion load/force/tension measurements. Features : Available from 0 - 5Kgf to 0 - 20Kgf capacities for vide range of industrial applications. It meets to IP65 Class for environmental protection.